If you go to Stockholm, Sweden, chances are you’ll be told to visit a restaurant called Hasselbacken. It’s been an institution on the Scandinavian culinary scene for centuries! One of the things they are best known for are their special potatoes – called Hasselbackspotatis in Swedish. Hasselbackspotatis are potatoes that have been sliced repeatedly about half-way through and then baked. Once the potato is partially done, the chef squeezes the potato to open up the slices kind of like a fan. A variety of things can now be added to the space between the slices before it is returned to the oven. Traditionally, it would be butter, breadcrumbs and almonds. These potatoes became so famous that people traveled far and wide to try them. And, chefs from around the world started to offer them on their menus too. Hasselback Potatoes were a big hit. But, you’re here for an Ambrosia apple recipe so you may be wondering why were giving you a history lesson on Swedish potatoes! Simple – these potatoes are the inspiration for a delicious baked apple recipe that is easy and fun to prepare. 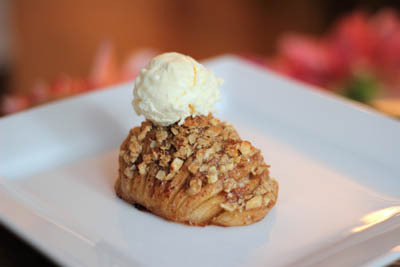 Crust-less Ambrosia Apple Pie could easily be called Ambrosia Apples a la Hasselbacken or Hasselback Apples because we use the same method used for the famous potatoes. Melt 1 tbsp of the butter and stir in half of the brown sugar (if desired), and half of the spice. Take your large Ambrosia apples and peel. Slice the apple in half and core them using a melon-baller or spoon. Place each half cut side down on a cuttingboard. 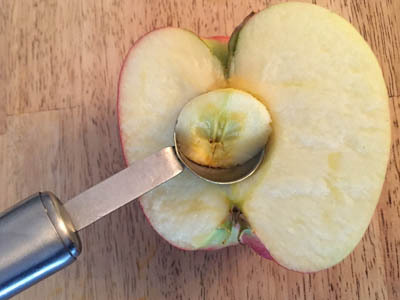 Slice slits into the top of the apples, slicing 3/4 of the way through the apple. Be careful not to cut all the way through your apple! Each slit should be about 1/4 inch apart. Brush the tops of the apples with the spiced, melted butter. Don’t be shy – get all the way into those grooves. Coat an 8″ baking dish (glass or porcelain) with butter. Place apples flat side down and cover pan with tinfoil. Prepare the topping by combining remaining butter, sugar (if desired), and spice, with the oats, oat flour, and nuts. Use a fork or food processor (on low) to blend mixture until it is the consistency of a crumble or streusel (a bit chunky). Take the Ambrosia apples out of the oven after the 20 minutes and remove the tinfoil. Allow them to cool until they are comfortable to touch – about 5 minutes. Squeeze the apples on the side to open up the gaps on the top of the apple – kind of like opening an accordion. Sprinkle the topping over the top and into the gaps between the slices. Return dish to oven (uncovered) for an additional 15 minutes. Keep an eye on them to make sure the topping doesn’t burn. Remove the apples from the dish and allow to cool for 5 minutes. Top with vanilla or cinnamon ice cream. Or, if you’ve got a real sweet tooth, you could drizzle them with caramel sauce and top with whipped cream. You can really get creative with this recipe and have some fun. Why not let the kids make their own using a variety of conventional and unconventional streusel ingredients? You could try dried tart cherries, coconut flakes, pie crust balls, cheddar cheese, caramel, or even bacon bits! The result will be a very personal, crust-less Ambrosia apple pie.